Gilder Lehrman Collection #: GLC03864 Author/Creator: Adams, John (1735-1826) Place Written: Philadelphia, Pennsylvania Type: Autograph letter signed Date: 15 November 1775 Pagination: 3 p. : address : docket ; 25 x 20 cm. Summary of Content: Adams outlines the government that he envisions for America, that it should have executive, legislative and judicial branches, similar to the colonial government of Massachusetts. He also argues for a bicameral legislature and insists that judges not have overlapping offices in the other branches. Adams draws to an end with comments about human nature and tyranny. He concludes "if such a Trifle will be of any service to you or any gratification of Curiousity, here you have it...." On the evening of 14 November 1775, Lee, a delegate to the Continental Congress from Virginia, visited Adams at his Philadelphia residence. In the wake of Lexington and Concord, the two men discussed which form of government might be easily adopted by the colonies. 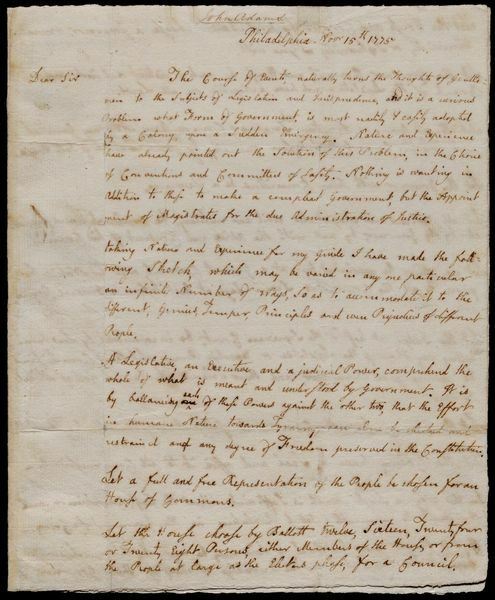 Lee requested that Adams write down his plan and then circulated both manuscript and printed copies of the letter to convince colonists that independence would not be as difficult as they feared. The Course of Events, naturally turns the Thoughts of Gentlemen to the Subjects of Legislation and Jurisprudence, and it is a curious Problem ...what Form of Government, is most readily & easily adopted by a Colony, upon a Sudden Emergency. Nature and Experience have already pointed out the Solution of this Problem, in the Choice of Conventions and Committees of Safety. Nothing is wanting in Addition to these to make a compleat Government, but the Appointment of Magistrates for the due Administration of Justice. A Legislative, an Executive and a judicial Power, comprehend the whole of what is meant and understood by Government. It is by ballancing [struck: one] [inserted: each] of these Powers against the other two, that the Effort in human nature towards Tyranny can alone be checked and restrained and any degree of Freedom preserved in the Constitution. Let the House choose by Ballott twelve, Sixteen, Twenty four or Twenty Eight Persons, either Members of the House or from the People at large as the Electors please, for a Council. Let the Governor, Council, and the House be each a distinct and independent Branch of the Legislature, and have a Negative on all Laws. Let the Lt. Governor, Secretary, Treasurer, Commissary Attorney General, and Solicitor General, be chosen annually, by joint Ballott of both Houses. Let no officer be appointed but at a General Council, and let Notice be given to all the Councillors, Seven days at least before a General Council. Let the Judges, at least of the Supreme Court, be incapacitated by Law from holding any Share of the Legislative or Executive Power, Let their Commissions be during good Behaviour, and their Salaries ascertained and established by Law. In Adopting a Plan, in Some Respects Similar to this human Nature would appear in its proper Glory asserting its own [re]al Dignity, pulling down Tyrannies, at a Single Exertion and erecting Such new Fabricks, as it thinks best calculated to promote its Happiness.